Beads, feathers, spangles and sequins. 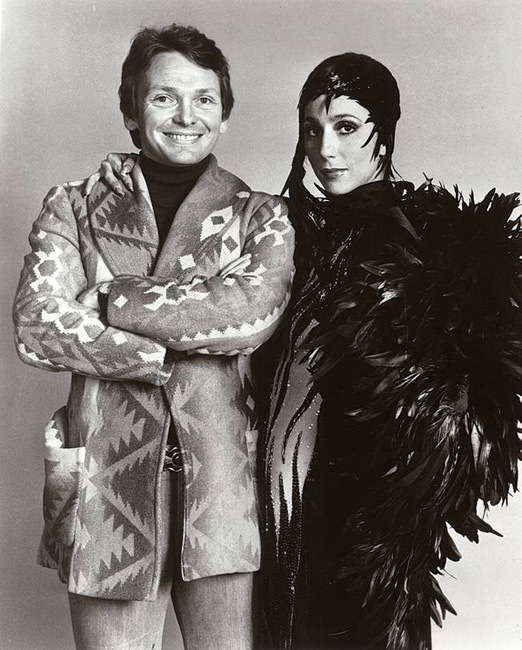 Perhaps Bob Mackie’s best known achievement was his role in transforming Cher from hippie chick, to glam Oscar-winning screen goddess. Mackie began his career as a Hollywood costuming sketch artist, working for both Edith Head and Jean Louis. While working with designer Ray Aghayan, Mackie soon began creating on- and off-screen evening clothing for the divas who would make him a household name – most notably Carol Burnett, Diana Ross, and of course, Cher. He started his own ready-to-wear line in 1982. His contributions to fashion were recognized in 1999, with the Bob Mackie Retrospective at The Museum at The Fashion Institute of Technology. In 2001 he was honored by the American Council of Fashion Designers of America. Mackie presented his last runway show in 1992, when his business folded. He currently designs, and sells clothes under the Bob Mackie name, for the home shopping network, QVC.